The Coveo connector supports indexing Microsoft Exchange Online mailboxes whether the mailbox owners are federated (listed in a local AD and synced or not in Azure AD) or cloud-based users (will be listed using Azure AD). The only requirement for an online mailbox to be indexed is that the mailbox owner can be found either in a local AD or using Azure AD. In Azure AD, users with an on-premises Exchange plan and users with an Exchange Online plan cannot be distinguished, meaning that it is currently not possible via a Microsoft API to ONLY list Exchange Online users/mailboxes. However, using the procedure outlines in this topic, the content of all Exchange Online mailboxes of your organization will be searchable and accessible by their owner. Moreover, during the indexing process, all local mailboxes, which are owned by on-premises Exchange users, are ignored. Do not use the procedure in this topic when you want to configure a source for Exchange content that fully resides on an Exchange On-Premises Server, rather see Configuring and Indexing a Microsoft Exchange Source for an On-Premises Deployment. 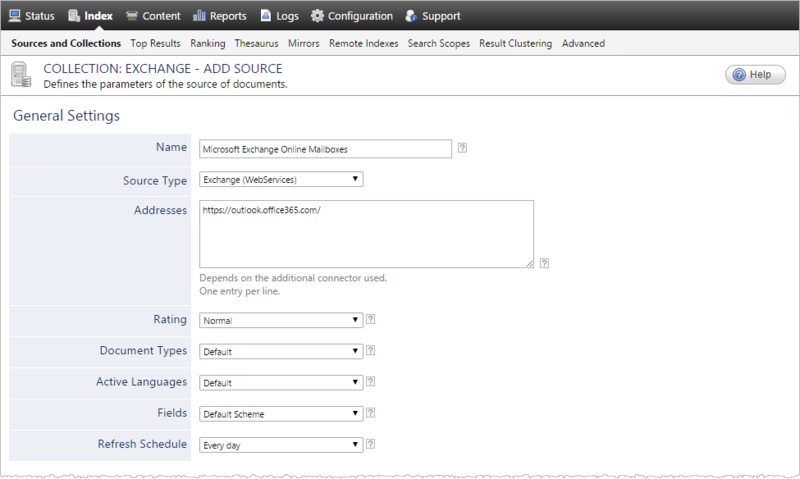 A source defines a set of configuration parameters for a specific Microsoft Exchange server. Enter a source name of your choice that represents the scope of the source. The connector used by this source. For an Exchange Online case, select Exchange (WebServices). Note: If you do not see Exchange (WebServices) in the Source Type list, your environment does not meet the requirements (see Microsoft Exchange Connector Requirements). List of starting points for the connector, typically one address. When you specify more than one address, you must ensure that all other parameter values apply to all specified starting addresses. The connector supports both secured https and unsecured http servers. Example: If this source was for a local or remote Exchange archive, you may want to set this parameter to Low, so that in the search interface, results from this source appear lower in the search results compared to those from other sources. If you defined custom document type sets, ensure to select the most appropriate for this source (see What Are Document Type Sets?). If you defined custom active language sets, ensure to select the most appropriate for this source. Number of reconnection attempts performed when the Exchange server fails to reply to a request. Delay between reconnection attempts in seconds. Name of the folder hosting all the mailboxes. The default value is exchange. It corresponds to the segment of the URI that is after the server name and points to the mailboxes https://ExchangeServer/exchange/. Whether to use forms-based authentication. The check box is cleared by default. Standard Microsoft Exchange forms-based authentication. ISA server forms-based authentication. When an ISA filter is put in front of the Microsoft Exchange OWA server. Whether to index the permissions specified in Microsoft Outlook. The check box is cleared by default. Select this check box when you want the Coveo connector to index user defined permissions as well as the Active Directory permissions. Note: CES 7.0.8047+ (December 2015) Due to an Exchange Web Services limitation (which limits the number of online mailbox subscriptions to approximately 20), the callback service is no longer used by default (see Exchange Online Throttling and Limits FAQ). You have exceeded the available subscriptions for your account. Remove unnecessary subscriptions and try your request again. (When you set the UseCallbackServiceForMultipleExchangeOnlineStartingItems hidden parameter to true) Parameter indicating the location of the Exchange Callback Service that enhances the incremental refresh performance when you have less than 20 mailboxes or public folder to index (see Fine-Tuning the Exchange Callback Service). The default value (http://localhost:8181/) is appropriate when the Exchange Callback Service runs on the same machine as CES. When the service runs on another computer, replace localhost by the Exchange server machine name. Change the port when the service does not use the default port (8181). Leave the parameter empty to disable the service. Name of the public folder. The default value is public. It corresponds to the segment of the URI that is after the server name and that points to the public folders https://ExchangeServer/public/. Whether to index junk emails or not. Junk emails are indexed by default. Whether to skip indexing of items archived by an external archiving system, such as Symantec Enterprise Vault. 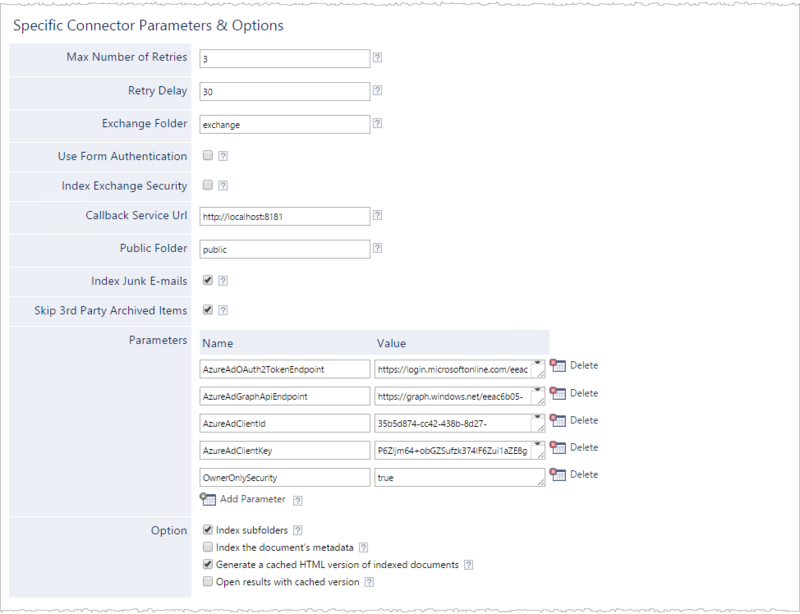 This parameter is useful to make the Microsoft Exchange connector ignore email stubs left behind by an external archiving system. The check box is selected by default. Note: Do not confuse the Skip 3rd Party Archived Items with the IndexArchive hidden parameter, which controls whether Exchange archive mailboxes should be indexed (see Modifying Hidden Microsoft Exchange Source Parameters). AzureAdOAuth2TokenEndpoint The endpoint used to obtain an access token using OAuth 2.0 (see Authorizing the Coveo Connector to Access the Exchange Online Mailboxes of Your Azure AD Users). AzureAdGraphApiEndpoint The endpoint used by the Azure AD Graph API to access directory data in the Windows Azure AD directory (see Authorizing the Coveo Connector to Access the Exchange Online Mailboxes of Your Azure AD Users). AzureAdClientId The Azure AD client ID you previously obtained (see Authorizing the Coveo Connector to Access the Exchange Online Mailboxes of Your Azure AD Users). AzureAdClientKey The Azure AD client key you previously obtained (see Authorizing the Coveo Connector to Access the Exchange Online Mailboxes of Your Azure AD Users). When you select this check box (recommended), at indexing time, CES creates HTML versions of indexed documents. In the search interfaces, users can then more rapidly review the content by clicking the Quick View link rather than opening the original document with the original application. Consider clearing this check box only if you do not want to use Quick View links or to save resources when building the source. When your users are cloud-based (Azure AD users), select (none). Note: When the Azure AD hidden parameters are specified on the source, this parameter becomes optional. When your users are federated (local AD users), select Active Directory or a custom Active Directory security provider that you created for a specific domain (see Configuring an Active Directory Security Provider). When your users are cloud-based (Azure AD users), select the security provider that you created for this source (see Microsoft Exchange Connector Deployment Overview). When your users are federated (local AD users), select (none). In the Authentication drop-down list, select the user identity that you created for Microsoft Exchange Online. Note: The user must be in an email format and NOT in the domain\username format. Consider modifying advanced source parameters (see Modifying Hidden Microsoft Exchange Source Parameters).